Lots of things in life create messes that need to be cleaned up — even in our bodies. Think of a playroom after a long day of family fun — toys and games strewed about the room, which if not tidied, we often end up tripping over. The same holds true for our bodies. After a holiday season of overeating and overindulging, our bodies need straightening up to function at their best, otherwise our digestive system becomes cluttered with toxins. And with cold and flu season in full swing, a body clean up will not only help to improve your digestive system, but it may also help boost your immune system as well. The goal of detoxing is to eliminate toxins in the body. Toxins are unusable products resulting from the metabolism of nutrients, pollutants, pesticides, food additives, medical drugs and alcohol. 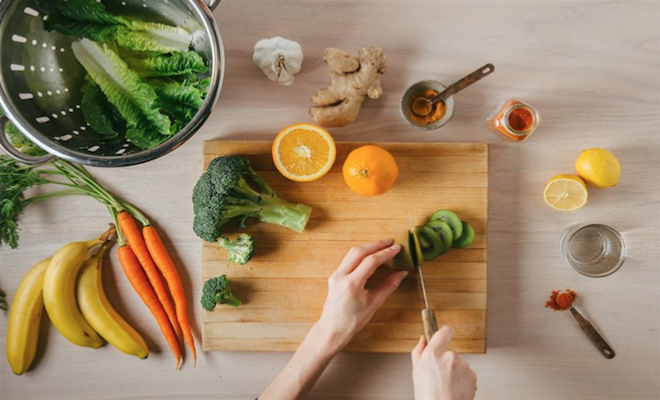 A true detox doesn’t require fasting or flushing your colon clean, instead it’s finding ways to boost your body’s own natural detoxification system to rid itself of harmful toxins. Eat organic. Reduce the toxins you take in by choosing organic foods that contain no artificial ingredients or synthetic preservatives and are GMO-free. Jumpstart your day with delicious Nature’s Path Flax Plus(R) Pumpkin Flax Granola that is rich in flax seeds and high in fiber. Power up with plants. Phyto (plant) nutrients such as antioxidants found in fruits, vegetables, spices, whole grains, nuts and seeds create your bodies clean up team. Eat more and let them naturally help clean up your digestive system. Follow the rainbow. Variety is essential to a healthy diet, and it is important to add a rainbow of colorful, spices and blends of grains, seeds and nuts to your diet. Find fiber. In order to eliminate toxins through our body’s digestive tract, we need to eat foods rich in fiber and nourish good bacteria it is also important to choose foods that contain nutrients like magnesium that support healthy motility of the digestive tract and bitter herbs which help stimulate the digestive tract. Nourish with nutrients. Our internal detoxification system needs the right nutrients to nourish our bodies. Add healthy and good-for-you foods such as, broccoli, garlic, leeks, sesame seeds, greens and beans to your diet to boost your energy level and cleanse your body at the same time. Finally, detox foods can be delicious as they are nutritious. Check out this fiber-rich recipe that is sure to have your friends and family asking for seconds. Preheat oven to 400°F. Line two baking sheets with parchment paper; set aside. Mix together Pumpkin Flax Granola, bread crumbs, 2 tablespoons coconut oil, ¼ teaspoon each pumpkin pie spice, salt and pepper. Spread evenly on baking sheet; bake for 6 or 7 minutes or until mixture is crisp and golden brown. Toss together squash, brown sugar, thyme, and remaining pumpkin pie spice, salt and pepper; arrange on prepared baking sheet. Roast for 30 to 35 minutes or until fork-tender and lightly browned. Arrange squash on platter and top with granola mixture. Tip: To make fresh bread crumbs, pulse day-old bread in a food processor until it resembles coarse crumbs; store in airtight container in the freezer for up to one month.